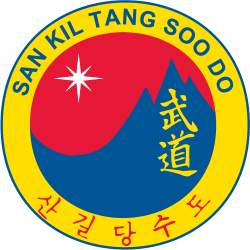 San Kil Tang Soo Do was founded on May 30, 1996 by Kwan Jang Nim David Sgro. The style of San Kil (Mountain Path) is based on the classical marital art Tang Soo Do (China Hand Way). The mountain path represents challenges that we all face in life and must persevere to overcome. This philosophy is represented in the style's logo or "Kwan Gi" (shown to the right). Tang Soo Do (Hangul: 당수도) is the Korean pronunciation of the Chinese characters 唐手道. Tang Soo Do literally means "The Way of The Chinese Hand" and has roots in various styles of martial arts including those found in Korea, China, and Okinawa. These roots started in Korean Soo Bahk, Chinese Shaolin, Okinawan Te and Japanese Shotokan. The first word "Tang" represents the Chinese Tang Dynasty (617-907 AD). Tang Soo Do is shaped by 60% Soo Bahk Do, 30% northern Chinese and 10% southern Chinese. Kicking techniques, for which Tang Soo Do is unsurpassed, are based on Soo Bahk. According to the history of the Moo Duk Kwan (from which the majority of all modern Tang Soo Do stylists trace their lineage) can be traced to a single founder: the late Grandmaster Hwang Kee. The Moo Duk Kwan was founded in 1945. Kwan Jang Nim Hwang Kee learned Chinese martial arts while in Manchuria. He also was influenced by the indigenous Korean arts of Taekkyon (택견) and Subak (수박). He has also written that he learned the philosophy of Okinawan Karate from Gichin Funakoshi's books. Kwan Jang Nim Hwang Kee also was highly influenced by a 1790 Korean book about martial arts called the Muye Dobo Tongji (武藝圖譜通志 / 무예도보통지). Hwang Kee combined what he knew of the Chinese and Korean martial arts he'd studied into an art he called Hwa Soo Do, referring to the Hwa Rang warriors of ancient Korea. Translated literally the name means "the Way of the Flowering Hand" and opened his first Hwa Soo Do Moo Duk Kwan Dojang (Studio/Training Hall) on November 9, 1945. Due to the public's unfamiliarity with the term Hwa Soo Do, he had difficulty in building interest. Because of this, Grandmaster Hwang Kee made the decision to rename his art Hwa Soo (Tang Soo) Do. The public was much more familiar with the term Tang Soo Do and this simple change was instrumental in conveying that he was teaching a martial art. Eventually the art would come to be known as Tang Soo Do Moo Duk Kwan, an amalgamation of the school's name of Moo Duk Kwan combined with the martial art of Tang Soo Do. Hwang Kee issued the first black belt of the Moo Duk Kwan system in 1948 to Kim, Un Chang (#1). All current and former Moo Duk Kwan members can trace their lineage to Hwang Kee through the numbers he issued along with each black belt, establishing a family tree of sorts. Current numbers issued in Moo Duk Kwan exceed 40,000. In 1957, the first young American servicemen in Korea began earning black belts. The first two to do so were Dale Drouliard (#757) and Mariano Estioko (#759). Because of the large number of servicemen stationed in Korea and the potential profit that could be earned by school owners, other servicemen trained with the intent to earn black belts. In October 1959, the first Tang Soo Do studio was opened by Mariano Estioko in Sacramento, CA. In 1960 several other studios opened. In April, Robert Thompson (#1791) opened a studio in Dayton, OH. Also in April, Lawrence Seiberlich (#1815) opened a studio in St. Paul, MN. In August, Dale Drouilard opened a studio in Wyandotte, MI. In October, Robert Cheezic (#2278) and Chuck Norris (#2819) opened studios in Waterbury, CT and Torrance, CA respectively. Charles Ferraro (#19985) began training Tang Soo Do with Robert Cheezic. In 1975, he and Robert PetroRoy (#12942) founded the New England Tang Soo Do Academy, later re-named West Haven Academy of Karate. In 1976 he became a student of Hyun Chul Hwang (#509), and son of the late Grandmaster Hwang Kee, founder of Tang Soo Do Moo Duk Kwan. That same year, Charles Ferraro opened his first dojang in New Haven, CT. In 1974, David Sgro (#22923) began studying Go Ju Ryu with Hanshi Ralph Vergalitto. In 1978 he began studying Tae Kwon Do Moo Duk Kwan with Michael Enright; and Tang Soo Do Moo Duk Kwan with Charles Ferraro and Roger Petro Roy. He is currently a student of Song Ki Kim (#312), founder of the World Dang Soo Do Union. In 1987, Larry Gilliland (#30776) began training in Goshin Jitsu while a student at Penn State University. Prior transferring to University of Connecticut in 1988, he began his study of Tang Soo Do Moo Duk Kwan along side Mike Torchia (#30847) in New London, CT with David Sgro.